Last weekend my Husband and I went for a drive on route 88 in Northern California. We came across a town called Clements. There wasn’t much there, but we drove by a fruit stand called Clements Ridge and I screamed turn around, turn around. He did and when we went up to this little market there was an abundance of freshly picked produce. They has homemade pot pies, desserts, sandwiches and even olive oil, honey, nuts and of course fruit and vegetables. I saw a bunch of beautiful blackberries. The owner of the stand said we just picked them fresh this morning. He also informed me that blackberry season is pretty much over. Oh no, I thought. So I picked up the remaining blackberries that they had. They are sweet and very dark in color. I gave one to my husband and I said now this is what a blackberry tastes like. Funny, we buy produce in the store, but nothing has the taste like in season, freshly picked produce. He was actually shocked on this is how a blackberry tastes. So the owner packed up my blackberries and off they went with me. I ate most of them straight from the carton, but I had a few left and I wanted to preserve them, so I decided to make homemade Blackberry Soda. The soda came out beautifully and it is so easy to make. The soda has a nice sweet blackberry taste. I was quite impressed. The color of the soda tuned out to be a very dark purple color. It kind of reminds me of the color of grape juice. I gave up drinking soda over 5 years ago, it’s actually been longer, I don’t even remember. I don’t miss soda, and it was one thing I could give up easily, which was pretty good since I used to drink Diet Coke like it was going out of style. The Blackberry Soda brought me back to childhood days when my Mom used to buy generic fruit flavor soda. 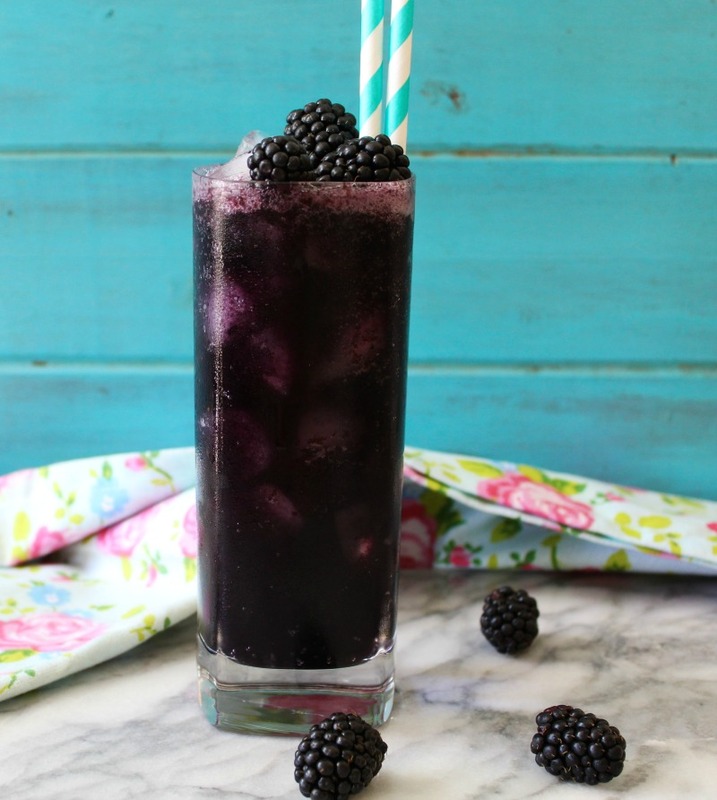 The Blackberry Soda is sweet and bubbly and when you crave those little bubbles, this is the perfect soda to drink. It’s guilt free, low-calorie and a breeze to make. 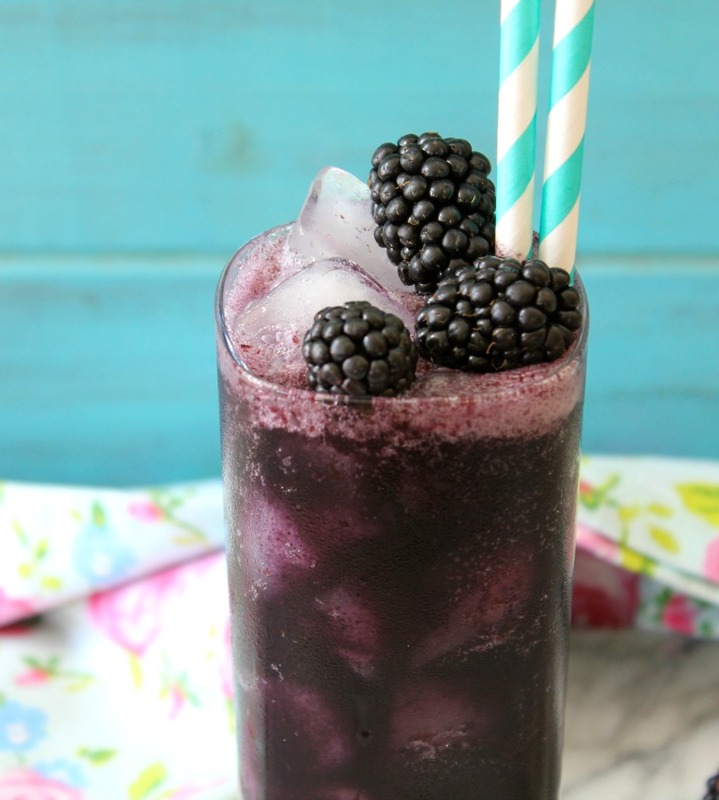 To make the soda part, I added about 3 tablespoons of blackberry syrup in a glass, added ice and filled the rest of the glass with club soda. 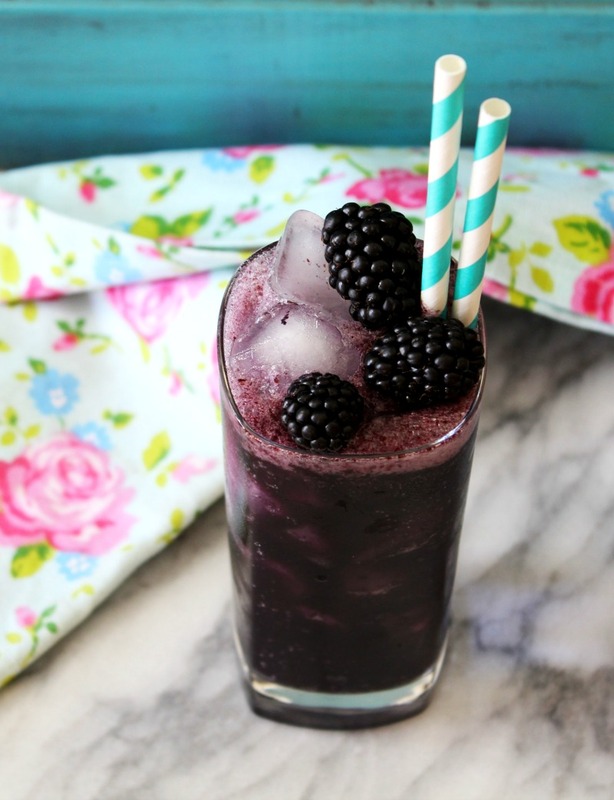 Add a straw, some more blackberries for garnish and you have a light summer drink to refresh the taste buds. I wanted to tell you the blackberry syrup is also great on top of yogurt, ice cream, pancakes and more. It tastes so good. Trust me, you will love having this syrup in the refrigerator. A simple soda made with fresh berries, a little bit of sugar and club soda. The perfect refreshing summertime drink. 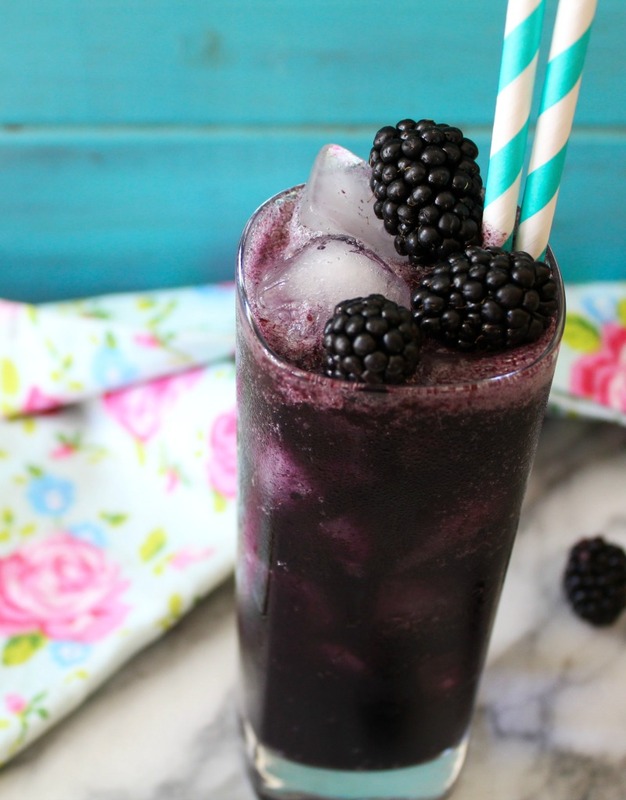 Add blackberries, sugar and ¼ cup water to a blender. Process until smooth. Place a fine sieve over a bowl and by batches add the blackberry sauce. With a back of the spoon press the blackberries through. 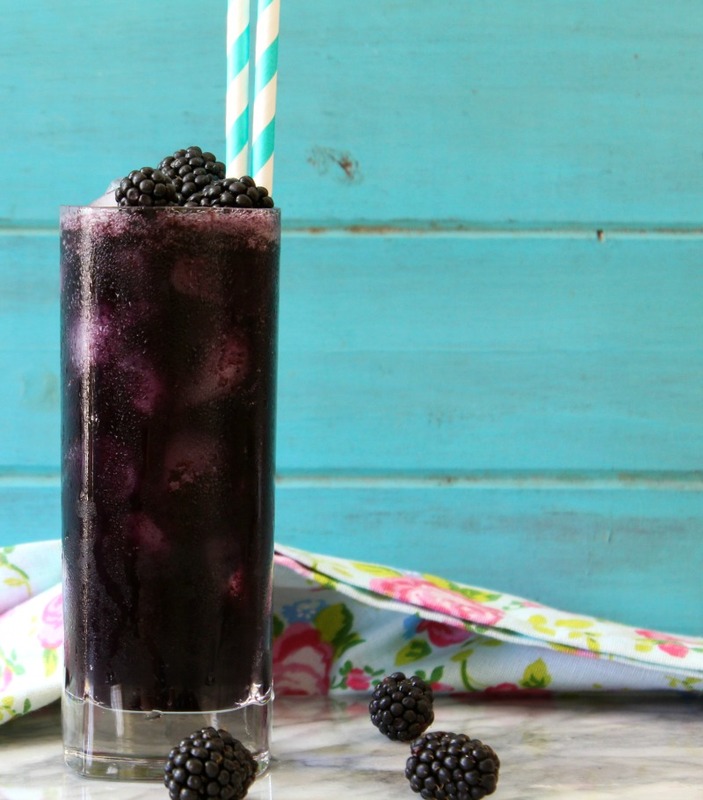 In an 8 oz cup, add 3 tablespoons (or more to taste) of blackberry sauce, ice and fill the rest of the glass with club soda or sparkling soda. Cover and refrigerate the blackberry syrup for up to 5 days. You will have 1¼ cups of blackberry syrup. Cover and reserve in the refrigerator and use on other things like pancakes, yogurt, and ice cream. I hope you have a great week. I was on vacation last week, and it is so hard to go back to work. blah!